Combustible metal dusts present extra risks and hazards to workplaces, and setting up standards to mitigate those risks is crucial to ensuring the safety of a location. In addition to dust collection, metal working and processing industries must take care that collection standards are met to ensure safety, because metal dusts can conflagrate inside of a collection bin. Finally, because combustible metal dusts are conductive, they often require special consideration to prevent explosions. Combustible dusts are produced by a wide range of metals, including but not limited to aluminum, lithium, magnesium, tantalum, titanium, zirconium, and other metals, which produce fine dusts when milled, shaped, and finished, and otherwise processed through a machine. 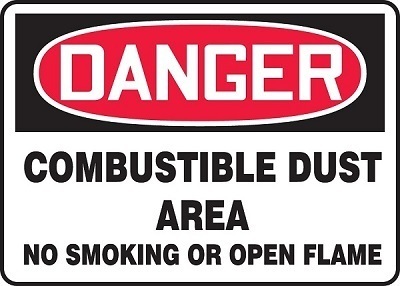 A Combustible Dust Hazard Analysis is mandatory for all workplaces where combustible dusts are produced. This hazard analysis is designed to help you identify risks, in order to create solutions based on the location. The DHA should involve a review of the dust, it's combustibility, the minimum explosible quantity (MEQ), the size required for the dust collection system, housekeeping requirements, and other details. The NFPA 654 outlines the full steps to completing a dust hazard analysis. You can also check some of the requirements here. Metal dusts have special requirements, and that often means that a standard dry media dust collectors are not suitable. In fact, for combustible dusts including niobium, tantalum, titanium, and zirconium, dry dust collection does not comply with NFPA standards. This means that a wet dust collector may be necessary in order to meet the standards outlined in the NFPA 484. Because metal dusts are conductive, even small sparks and static electricity can cause an explosion hazard. Standard ducting often has the potential to create static electricity, but there are other hazards as well. Mixed Materials – Wood dust, aluminum dust, and steel dust can mix together to create extremely flammable and explosive materials. It is crucial to isolate materials as much as possible when working in areas that create more than one type of flammable dust. Sparks – Because metals are often hot during the dust creation process, it is important to use isolation to prevent any flames or conflagration from spreading through the entire dust collection system. Appropriate venting, explosion venting, and isolation devices are crucial to the safety of the system. Ignition Energy – Most metals have a low minimum ignition energy (MIE) which means that it is important to prevent the buildup of electrostatic energy. Risks of static sparks can be mitigated by using wet dust collection rather than air material separation dust collection and by maintaining an air pressure PSI in the system that will prevent dusts from building up in any part of the system. Ignition sources for metallic dusts can range from electrostatic energy to heat produced by malfunctioning gears or belts. It is important to identify all ignition sources as well as potential ignition sources in order to isolate them and keep them away from dust collection equipment. Housekeeping is extremely important for preventing combustible dust explosions, and should be determined as part of your Dust Hazards Analysis. Dust will typically build up in some areas, even with on-site dust collection, and it must be cleaned on a regular basis. Your DHA will allow you to determine how frequently, by tracking how quickly dust builds up, and using the minimum explosible quantity (MEQ) to set cleaning standards that will prevent the dust from ever reaching the MEQ. Because metal dusts are typically a hazard to employees, your dust collection may be more strict than that required for explosion prevention. Metal dust collection requires extra considerations thanks to the flammability and high conflagration rates of the dusts. This means taking extra care to create a dust collection system and housekeeping standards in line with the NFPA 484.